Backyard chickens are becoming one of today’s hottest pets. Big names including Julia Roberts, Lady Gaga, Oprah – and even a contestant on The Bachelor – have helped terms like #chickenenthusiast trend, bringing fame to the ‘pets with benefits’ category. But raising backyard poultry isn’t just for celebrities. Today’s estimates show that more than 1 million U.S. families enjoy the fresh, wholesome eggs and undeniable companionship of backyard chickens. These benefits are just for families who live in the country, right? Surprisingly not. Backyard chickens can make excellent additions to a family – no matter where you live. In the U.S., we’re seeing an explosion of backyard chickens in both urban and rural areas. Purina has flock customers on all ends of the spectrum, including families with free-range birds in South Dakota and those with small flocks of chickens in Austin, Los Angeles, New York City and Chicago. 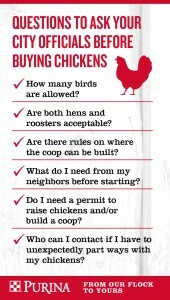 When considering raising backyard chickens, first determine if they are allowed in your area. 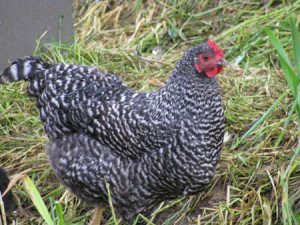 Many townships, villages and cities have embraced the benefits of backyard flocks; however, chicken keeping is not yet permitted everywhere. 1. Make sure backyard chickens are permitted in your area. To be certain chickens are permitted or if possible restrictions appear in your area, contact your local government officials. Begin the discussion by calling a member of your local planning board, county clerk or animal control representative. Contact information for the correct person can typically be located on your city’s website. Some cities have rules about the size of your flock, coop building or amount of acreage needed per animal. How many birds are allowed? Are both hens and roosters acceptable? Are there rules on where the coop can be built? What do I need from my neighbors before starting? Do I need a permit to raise chickens and/or build a coop? Who can I contact if I have to unexpectedly part ways with my chickens? 3. Secure a copy of the local ordinances. To be certain your new members of your family can stay in your family, secure a copy of the local ordinances and keeping it on file. 4. If backyard chickens are not allowed, empower change. If chickens are not zoned for by your local government, change is possible by amending local laws. Depending on your area, you may need to fill out various paperwork and attend a local government meeting. In this case, the best bet is to be prepared. Join forces with other flock enthusiasts in your area to outline the benefits of raising birds and a plan for raising chickens. Oftentimes, showing community support and the benefits are key drivers in adding chickens to a community. Many urban communities have a local meet-up or chat groups dedicated to raising backyard chickens. You can find one in your area with a simple online search. 5. Visit with your neighbors. Once you have the go-ahead to get started, visit your neighbors and share your plans with them. It’s always best to share plans in advance and to work together on the project. Describe the benefits, quiet nature and community opportunities of raising chickens. Your neighbors will likely be excited about visiting their new community members. Your family should now be ready for one of the most exciting parts of the process: designing the flock. There are hundreds of breeds to choose from. Determine if you wish to have chickens for eggs, meat or show. Explore the breeds’ personalities, amount of space they need and if they are right for your climate. Then, pick up supplies and start small with a flock of 4 to 6 chicks. Argyle Feed & Hardware is a good resource to help you get started! This entry was posted on Sunday, January 13th, 2019 at 7:14 am	and is filed under articles, Chicken Chat, Chicken Tips, Chicks, News & Updates. You can follow any responses to this entry through the RSS 2.0 feed. Both comments and pings are currently closed.